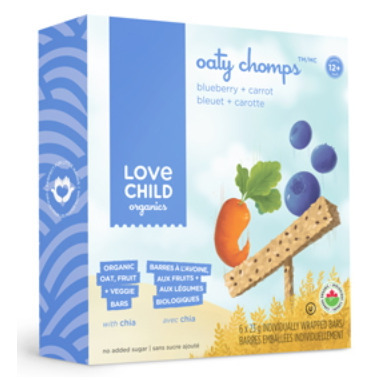 Your little one will love Love Child yummy Oaty Chomps Bars (and parents will too!). They are a delicious healthy snack, made with oats, fruits and vegetables, plus the added goodness of chia seeds. 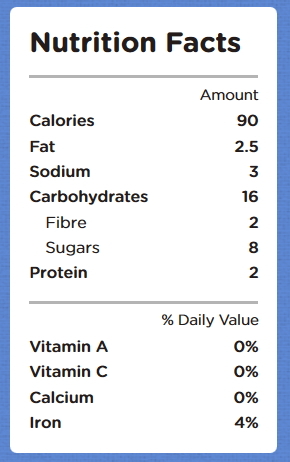 A short, easy to understand ingredient list, no added sugar and real whole fruit – why aren’t all bars like this?! Oaty Chomps are perfect for lunchboxes or when out and about. Ingredients: Organic oats, organic dates (coated with organic rice flour), organic raisins, organic sunflower oil, organic apples, organic blueberries (organic blueberries, organic apple juice concentrate), organic chia seeds, organic carrot powder, organic tapioca flour, organic flavour. May contain: Tree nuts, sesame. My son loves these! There is only one grocery store in our small town, and they only carry one flavor (beets&raspberry). So it's nice to be able to order all the different flavors from here! Amazing for on the go. Clean ingredients and a hit with our toddler. My 3 & 1 year old both love these! My 1year old loves these. Sometimes he likes to share with me :) I like that the ingredients are all something i can actually pronounce! My toddler, and all his friends, love these. They are easy to pack around as quick snacks. These weren't a hit for my toddler. I tried a couple of different flavours and he either doesn't like the texture or the taste. Too bad, because I liked the ingredients list. My son loves these! The bar holds together despite always making its way to the bottom of the diaper bag. My 17 months old boy loves them! My toddler has loved these granola bars from the start. They were easy to break up in small pieces when he wasn't quite ready for the whole bar, and are super easy for him to bite through now that he can have it as one piece. Good ingredients and lots of different flavours to mix it up. I also love that they're not huge in portion size. I bought this product for my 2.5 year old grandson, he loved to eat them at snack time. I like the healthy ingredients in them. My 2 year old loves these. I also love them because of the wholesome ingredients. Bought for my one year old. He's not ready to hold it while and take bites of it, but it breaks apart easily (more crumbly than the other flavours), but I don't mind the mess b/c he loves the taste. My 21 month old loves these! Great product! My daughter LOVES these, and i love finishing what she leaves a bite, when she does. My little dude loves the entire line of Oaty Chomps. Always our go-to when i'm having trouble getting him to eat his fruits & veggies. Great ingredients, organic and my toddler loves it.